We recently launched an innovation in how we handle thoughts, allowing participants to prioritize thoughts before they have been grouped by facilitators. At the time, we launched a Thoughtexchange Process for you to share your thoughts about the challenges and the benefits you anticipated. Thank you for your valuable feedback, which can be viewed at Priorities before Converge. In this post, we take another look at the reasons for this change, and address some of the concerns and questions that you raised. In April, we launched an innovation in how we handle thoughts. Previously, facilitators converged, or grouped, thoughts before participants assigned stars to prioritize. The process of grouping and naming groups of thoughts could introduce facilitator bias before the community had a chance to understand diverse points of view. Our innovation is to allow participants to prioritize thoughts before grouping, so that they can consider and place value on real thoughts from real people. In our experience with hundreds of stakeholder engagements over the past few years, we have learned that this is where connection and genuine understanding occurs. Only after participants have learned from one another and assigned their stars does the facilitator group similar ideas together. Those who have experienced the new process say that they feel it is more honest, authentic and informative. We believe it increases the opportunities for real community learning. In addition, the new process creates richer data for analysis, is more efficient for facilitators and eases the burden of approving converged thoughts. When we introduced this innovation, we launched a Thoughtexchange Process for you to share your thoughts about the challenges and the benefits you anticipated. The results can be viewed at Priorities before Converge. Your responses make it clear that one of the key benefits of the changes for you are in reducing facilitator bias. Other benefits that are important to you include transparency, not overwhelming participants with too many thoughts, and making participants feel heard rather than edited or carefully contained. Here are our responses to some of the concerns and questions you raised. Without grouping, how will participants prioritize so many thoughts? 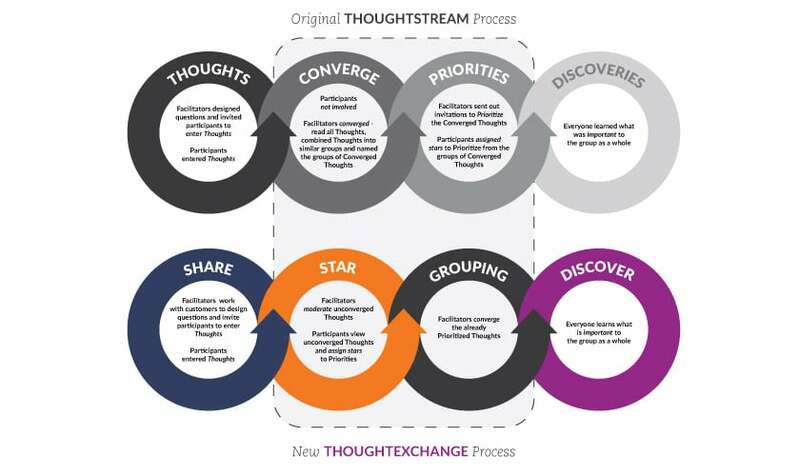 Most Thoughtexchange Processes receive thousands of individual thoughts. Our software now handles these large volumes by showing each participant a selection of thoughts, rather than every single thought shared. Since people are better at processing smaller chunks of information, these thoughts are viewed over several pages, with no more than a dozen thoughts on each page. Will the participants be concerned that they do not see all the thoughts? It would be unrealistic to expect participants to prioritize thousands of individual thoughts, without being overwhelmed with the feeling that there is just too much to consider. Though participants might not now see all the thoughts, our software ensures that every thought is seen by an equal number of participants, and participants always see their own thoughts. What happens when you have a small group? In a smaller Thoughtexchange Process with fewer thoughts, every participant would see every thought. Could a participant see many thoughts that are similar but worded differently, thereby losing some of the scope of the overall thoughts? In randomly selecting a unique set of thoughts for each participant, our software is designed to present a broad range of thoughts that reflect the overall scope of the responses. Only where many people have shared the same idea are participants likely to see many similar but differently worded thoughts. Our new patent-pending software adjusts the star values during the grouping process to ensure that participants cannot unfairly influence the results by assigning many stars to similar thoughts. This innovation ensures that unique ideas shine through. Watch for our next post where we’ll introduce our new process step names – Share, Star and Discover. 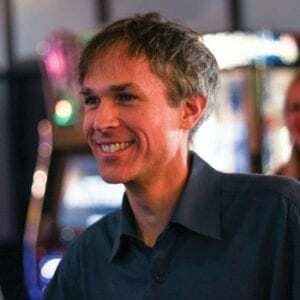 As Thoughtexchange's Director of Product Definition Mark has been designing and developing software for two decades in a wide variety of fields, including movie post-production and photonics simulation. Originally from the UK, Mark's working life has taken him on a circuitous route through seven continents, including Antarctica, where he worked for two years as a meteorologist. An inveterate communicator, Mark has written books, published web sites, instructed students and worked as a paramedic in rural B.C.